Davon Jefferson. DeMar DeRozan. Marcus Johnson. USC basketball fans have certainly been spoiled in recent years by incredible leapers capable of regularly producing rim-shaking dunks. No player appeared athletic enough this season to continue USC’s tradition of highlight-reel dunks. Until Wednesday. A little over two minutes into the second half, Byron Wesley inbounded the ball to Jio Fontan, who quickly swung the ball to J.T. Terrell, who stood waiting at the three-point line. Terrell pump-faked and dribbled past UCLA’s Travis Wear. The lane parted as Terrell exploded towards the rim, cocked the ball behind his head, and threw down a monstrous dunk, which you can watch HERE. Just like that silence fell upon Pauley Pavilion. Well, almost silence. The UCLA players could only look at each other dumbfounded, unable to explain the defensive breakdown. “That was definitely the best dunk anybody on our team has had this year,” Stewart said. The secret behind Terrell’s dunk? VertiMax. VertiMax, which is endorsed by the Baltimore Ravens’ Ray Rice, is a fitness tool designed to increase speed, power and vertical jump abilities. 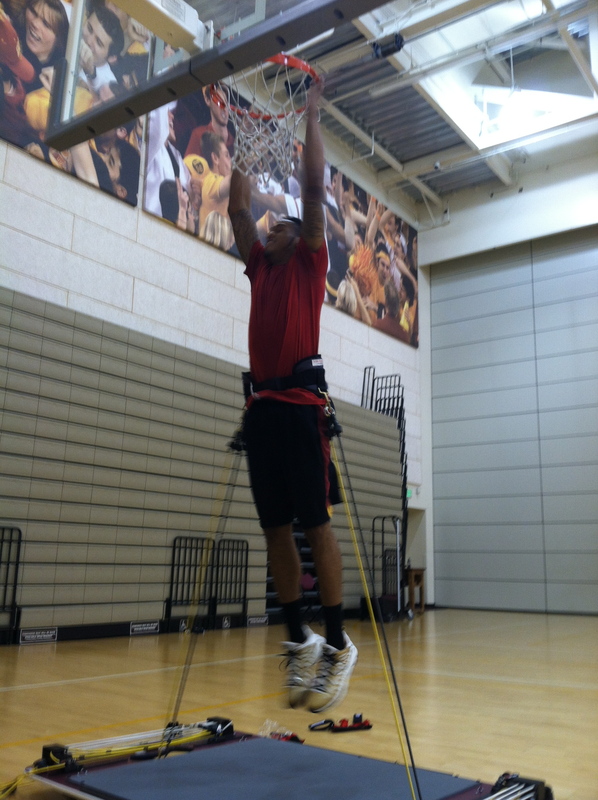 After practices, Stewart and Terrell attach VertiMax training bands to a belt and repeatedly jump towards the rim. The difference has proven to be more than just physical. And tear the rim down against UCLA he did. 2 minutes a day 3 times a week WILL get you 4-7″ increase on your vertical leap.